Last month, we launched The Free Orchestra series with the first free instrument: cinematic, orchestral Tutti Hits. Today, we’re releasing the second instrument in this new series. 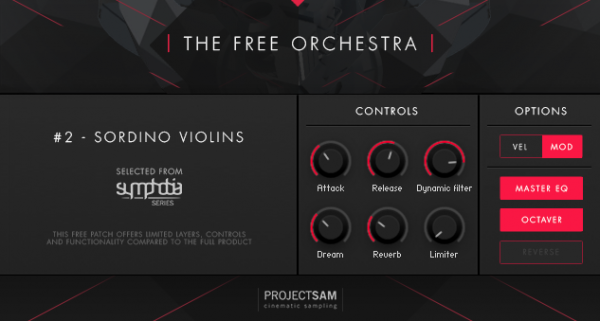 All Free Orchestra patches feature a dedicated Kontakt interface with a set of useful controls to adjust the envelope, reverb, filter and other elements of the instrument. 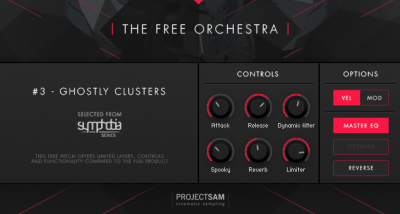 TFO #2 offers a unique Dream control that transforms the instrument into a warm, ambient pad. The Free Orchestra does not come with a Kontakt Player license, which means the full version of Kontakt is required. All Free Orchestra patches have been formatted for Kontakt 5.6.8. Sordino Violins comes with an open 44.1 kHz/24 bit sample pool. This means that you can directly access the wave files and use them on any platform that can handle wave files. Example are Ableton, Cubase, Pro Tools, FL Studio, HALion, Falcon – or your old hardware or Eurorack sampler. The samples folder includes a set of sustained notes (“tut”) and a set of release notes (“tur”). The latter set is used for release triggering, mentioned earlier. The sustained samples have loop point information saved in the file headers. Most samplers will automatically read these loop points when importing a sample. The sustained samples also have a loop point cross fade rendered into the audio. If you do not set the samples to loop, there will be a noticeable artifact at the end of this cross fade, where the sample is supposed to loop. Get Sordino Violins now by clicking the Get Now button. It will be automatically added to your ProjectSAM account, ready for downloading!